Defiance. I’ve seen it. I’ve played it. I know many of you are thinking, “Yeah, so did I. Co-Optimus gave us beta keys,” and you’d be right. I played the 360 beta with a few of you. We grouped up, played some co-op, shot some mutants, killed some hellbugs, and chased down an Arkfall or two. We also couldn’t log on and got booted from our games from time to time. Whatever. It was a beta. We help out Trion test their game systems, and in exchange we get an early taste of the game itself. A few days ago I was invited to Trion Worlds’ new offices and got some extra hands-on time with Defiance, playing a fresh build of the game and enjoying the uninterrupted play provided by a stable server. I liked what I saw. I think you will, too. 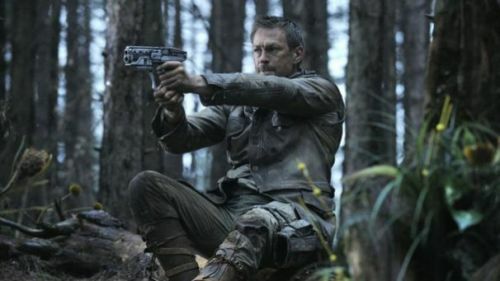 For the uninitiated, Defiance is a sci-fi themed, third-person shooter set on a near-future Earth. The world has been thrown into chaos after a devastating --you know what? There’s a whole TV show coming out that will give you all the plot you want. You really should check it out. There is also plenty of story and exposition dished out through in-game cutscenes and missions. I’ll let you enjoy those for yourself. All you need to know is you’re on Earth. It’s the future. There are hostile and friendly aliens, as well as monstrous creatures, various vehicles, and all sorts traditional and not-so-traditional weapons. You will play the role of an Ark Hunter --not to be confused with a Vault Hunter. A massive debris field made up of derelict alien ships liters Earth’s orbit. Giant chunks of wreckage rain down on the planet’s surface, providing valuable arktech for those who would claim it. As an Ark Hunter it’s your job to salvage these “Arkfalls,” fighting off hostile forces and partnering with equally ambitious allies. When you’re not claiming Arkfalls you’ll be able to pass the time with main story missions, side missions, the intriguing Shadow War, co-op instances, PvP events, races, challenges, and random environmental events scattered throughout the ruins of a partially terraformed northern California. 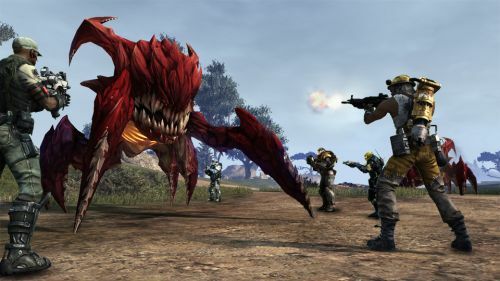 I played the PC version of Defiance with a 360 gamepad. Blasphemy, I know. I chose my character’s origin and appearance from a rather limited selection. There are eight alien races in the world of Defiance, but only male and female versions of humans and Irathients are playable, for now. From what I could tell, character origin affected my starting weapon and clothing, but not much else. I was free to develop my character any way I wanted. Having played an Irathient outlaw in the beta, I chose a human survivalist. The tutorial level was a little rough. I had to lower my graphical settings and resolution to get the game to run smoothly. The graphics looked similar to what I would expect from a console title. Trion Community Manager, Mathew Everett, explained that the PCs we were using didn’t have adequate graphics cards, which was kind of a bummer. He did provide access to a computer with better capabilities, and the game looked quite good with the settings maxed out. I’m not really a PC guy, but I can say that the game was markedly better on the gutsier machine. Once I left the tutorial area the game ran much more smoothly, even on the lesser PC. My survivalist was armed with a sniper rifle, grenades, and a pretty effective pistol. I was also protected with a regenerating shield, which has become a staple for sci-fi shooters. I was able to take out mutant riflemen and hellbug skitterlings with ease. Grenades run on a cooldown timer. They act more like of a special power than a commodity. Ammo for my rifle was in large supply. As the day went on I heard other players were having a hard time with ammo management, but I thought it was rather plentiful. I ran through a few brief story missions, earning points for my Environmental Guardian Online, or “EGO,” Defiance’s take on a leveling system. Increasing my EGO granted me access to special powers which could change the flow of battle. There are four basic powers: Blur, Cloak, Decoy, and Overcharge. I had already played as an Overcharged character, so I took my chances with the Cloaking ability. These powers are linked to each other in a large grid, providing players with a wide variety of unlockable perks such as defensive and offensive bonuses, as well as lower cooldown rates. Page created in 0.3047 seconds.